At some point in each of our lives, we will be required to give a speech. Just the thought of this is enough to send the most resolute and steadfast among us to his or her knees. 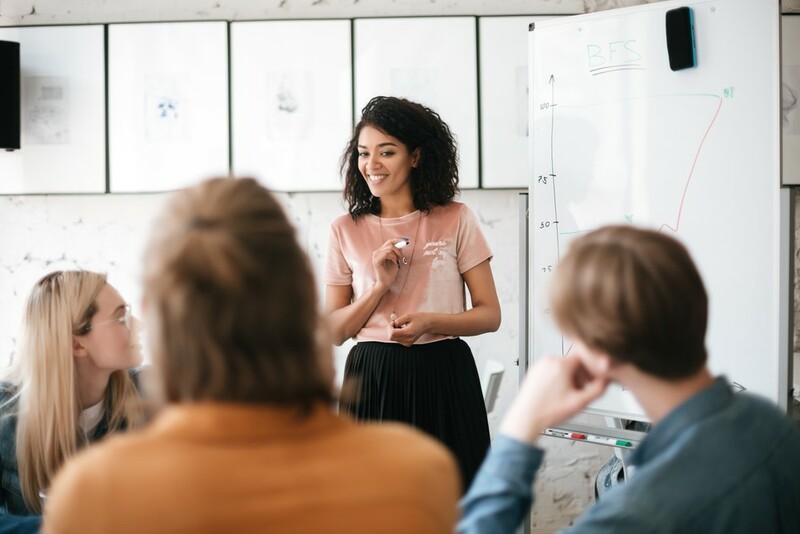 Even as more students are being taught the skills required to speak well in public, this activity is one of the most feared by human beings around the world. 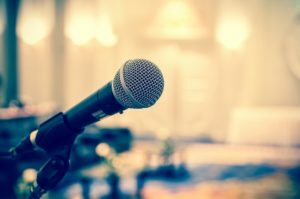 Fear of public speaking is one of the most common types of anxiety. This fear can cause anything from slight nervousness to paralyzing fear. Many people with this fear even vomit or faint when faced with public speaking. Thankfully, there are a myriad of ways to overcome this fear. Being nervous or anxious about public speaking is perfectly normal. This fear is a type of performance anxiety, as are stage fright, test anxiety, and writer’s block. The public humiliation over freezing up on stage is something even professional artists deal with. And they are not alone. This particular fear plagues successful and talented people in many fields. Even famous film director Michael Bay has stumbled with stage fright. His fumble caused a Twitter storm that prompted others to come to his defense. As filmmaker Zak Bagans wrote on Twitter…. Though many think they have overcome their fear, it’s like an addiction, always lurking in the darkness of the background. But in time, anyone can break the cycle of stage-fright and become a great public speaker. 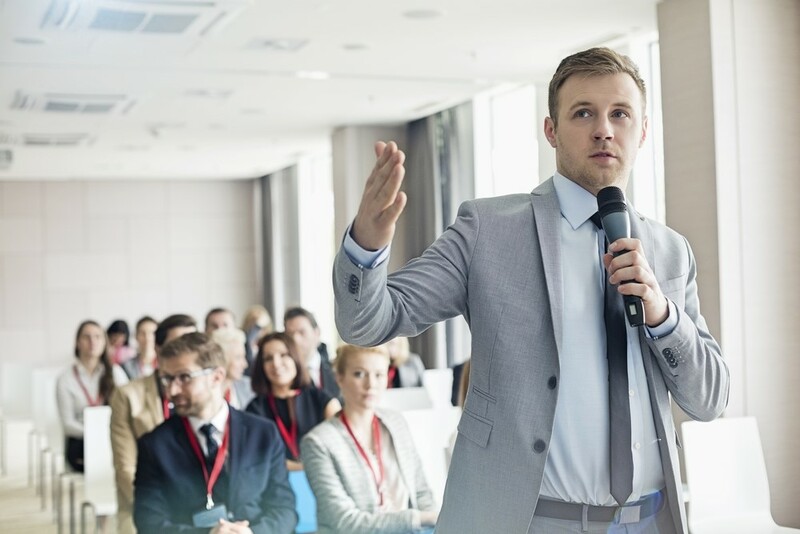 In this post, we're going to give you some keys to overcoming public speaking. While we can't do the speaking for you, we want to give you the confidence to stand up in front of people. Content in a speech is critical, but you must also consider the audience when creating and delivering your content. Engaging with the audience keeps you connected and you won't feel as alone. When you have a, "We're all in this together," attitude, the audience begins to feel like a support system rather than a firing squad. Ask thought-provoking questions and encourage audience members to answer or ask questions, either out loud or in their heads. It's also important to maintain your credibility and conviction. Don't equivocate or hedge. Be firm and say what you mean and mean what you say. Clear and direct communication are the key to maintaining your power on stage. Don't be afraid to slow down and pause to breathe. When you talk too quickly, you can wander off the point or make statements that have no relevance. Additionally, if you talk too fast, the audience has trouble processing what you're saying. You need to give them space to consider your words. There's no harm in pausing to collect your thoughts and take a deep breath. Don't read word-for-word from your slides, cards, or notes. This is just asking to bore the audience to death and usually results in you sounding stiff and robotic. Standing dead still is one other way to most certainly put your audience to sleep. Remember, you're engaging with your audience in a conversation of sorts. They may not be replying audibly to you, but they're consider what you're saying and even providing answers in their minds. Slow movement, good posture, eye contact, and occasional smiles will keep your audience interested in your words. And while a podium can be a useful tool, it creates a wall between you and the audience. They also have a tendency to turn into a hiding place when you get nervous. Don't stay behind the podium. Use gestures and walk around. Create movement and energy. Maintaining positive energy is a key to great speaking. Be passionate about your topic. Be knowledgeable and engaged. Positive thinking can help you stay focused and avoid traps like negative self-talk, such as What happens if I mess up? Anytime we speak publicly, our minds go to worst case scenario. We worry about forgetting the points we want to emphasize, passing out cold, or messing up badly enough to lose our jobs. These kinds of thoughts keep us from performing at our best - and they rarely happen anyway. But, the human body can betray us. When our fear increases, our adrenaline kicks in, speeding up our heart rate, making us sweat, and increasing our nervousness. Learning meditative or biofeedback techniques can help you calm down prior to going on stage. It is also very helpful to record and review your speeches. Though it can be embarrassing to watch, we can learn so much about our strengths and weaknesses by watching our own performances. This is just one of many tools that we can use to improve our public speaking. Deliver a performance, rather than a speech. An audience can become enraptured by a performance full of intelligence and wit. Use the power of eye contact. Draw your audience in by showing them you want them to be part of the whole experience - not just passive listeners. Don't hide behind the lectern. Lecterns and podiums never stopped anyone from poor public speaking. Move around and let the audience see you! Posture matters. Maintaining a good posture demonstrates your level of confidence. Slouchers are bad performers. Remember your body language. Tell compelling stories. A good story or anecdote can drive home a point or offer levity in an intense recitation. Vary your cadence. Don't speak with the same tone, the same pace, and the same words. Variety is the spice of life - and of speeches! Speak about what you know and care about. A passionate speaker is a prepared speaker. Knowledge and passion create great performances. When it's time to consider content, you should be the expert on the subject. If you aren't, then why did someone ask you to speak? Take advantage of knowing that you are considered an expert and that people are interested in what you have to say. Not tailoring your message to your audience. As Benjamin Disraeli once said, “Talk to a man about himself and he will listen for hours.” This speech is about passing knowledge onto the audience – not collecting accolades for yourself. Eye dart. You must establish meaningful, continuous eye contact with your audience if you want to keep them engaged. Distracting mannerisms. Make sure you are aware of your tics and gestures. This is where watching video of yourself is especially helpful. Low energy. Lack of enthusiasm is a sure speech killer. Audiences want to be energized and leave the speech talking about what they heard. Not rehearsing. Hardly anyone rehearses their performances. Big mistake. Those who do a full-dress rehearsal gain the appreciation of an entertained and informed audience. Data dumping. Don't rely solely on your stats to save your speech. You can speak well without standing on the pedestal of logic. Doing this makes the speech boring. Not inspiring. Drive home your passion for the topic with emotional appeals to the audience. Present an emotional argument, but then support it with your facts and evidence. Lack of pauses. There is no need to rush. Do not allow time constraints or anxiety turn your tongue into a runaway train! Use your pauses productively. Not crafting a powerful opening. According to Plato, "The beginning is the most important part of the work." Open with a compelling statement or anecdote that the listeners cannot ignore. Using too much (or not enough) humor. Test the waters with a joke early in the speech. Gauge the audience's response and sprinkle in the most appropriate amount of humor you can throughout the rest of the speech. Reading from your slides. Assume that your audience can read. While slides are an incredibly useful tool for keeping your speech on target, don't bore your audience by simply reading your presentation. Making an excuse or an apology. Don't start off with a negative tone. Always be enthusiastic. If you were running late, offer an anecdote: "A snow delay at a Midwest airport in February - who'd have thunk it?" Ending with Q&A. Be ready to take questions at any time during the presentation. Many people in the audience will not take notes and they will most likely not remember what they wanted to ask when the speech is over. Being a good performer when delivering a speech is about nailing the positives and avoiding the negatives. 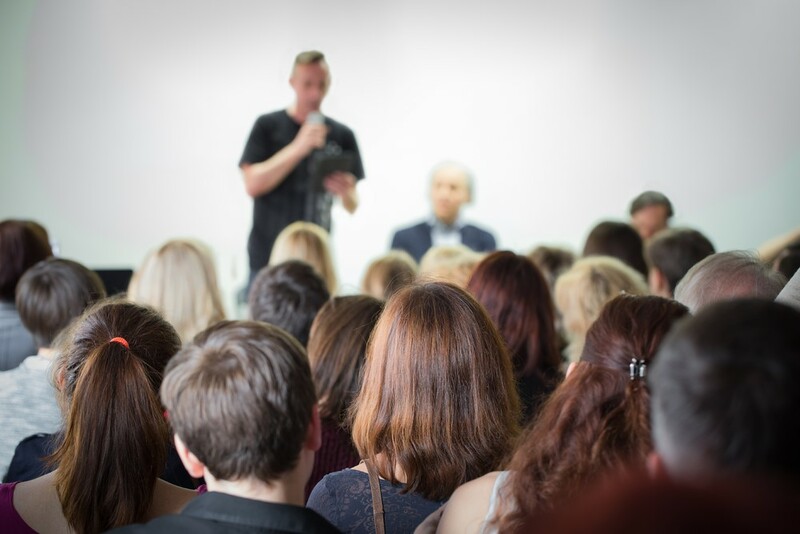 Be well prepared, offer anecdotes and humor if the audience is receptive, use your notes as tools rather than a straight read, keep your posture up to show your confidence, and don't allow your fight or flight mode take over the speech. Public speaking doesn't need to terrify you. If you implement these suggestions, you'll find yourself more relaxed, more effective, and maybe even enjoying yourself.